Support for the STM32F4Discovery board. Please refer to this document for the RIOTs pin mapping for the stm32f4discovery board. The pin mapping is chosen completely arbitrary and can be altered by editing the boards/stm32f4discovery/include/periph_conf.h header file. LEDs LD7 and LD8 are used by the USB connector for over-current (LD8) and data (LD7) indication. The STM32F4discovery board contains a 3-axis MEMS accelerometer that can sample with up to 1.6kHz. The STM32F4discovery board contains a on-board MEMS audio sensor. The board contains an digital analog converter (DAC) with integrated class D speaker driver. For using the STM32F4discovery board we strongly recommend the usage of the GNU Tools for ARM Embedded Processors toolchain. When connecting an I2C device and a logic analyzer to an I2C port at the same time, the internal pull-up resistors are not sufficient for stable bus operation. You probably have to connect external pull-ups to both bus lines. 10K is a good value to start with. If you want the terminal to work using make term command and get a message about missing tty device install the driver from http://www.silabs.com/products/mcu/pages/usbtouartbridgevcpdrivers.aspx . 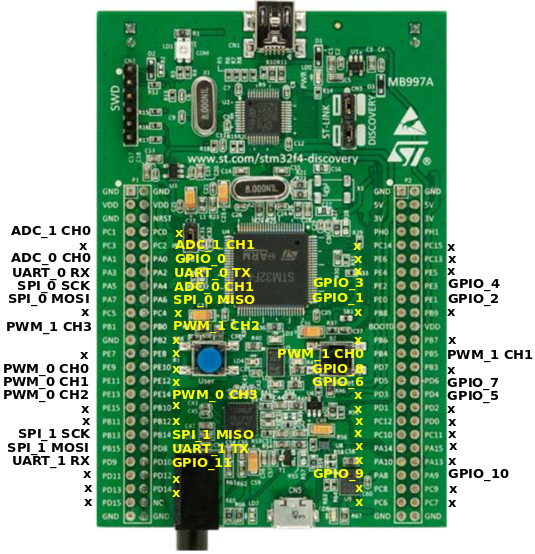 Board specific definitions for the STM32F4Discovery evaluation board.